Quit hitting the search engines if you’ve been trying to find just the right golf rangefinder for your leisurely game or for the tournaments, because you’ve come to the right place. It’s time to narrow down the search and find the one that’s fit for both the pro and the amateur player. Now you can give your typing fingers a break, because I have all you need to know about the pistol shaped, super fast, and light-weight laser rangefinders from Laser Link Golf. In this Laser Link rangefinder review we are going to check out 3 of their most popular devices. If you’re wondering whether you can really get a rangefinder that’s fit for golf, then wonder no more. 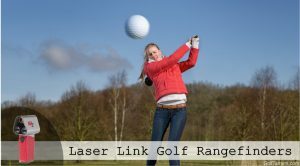 Laser Link Golf specifically specializes in sport optics for golf players. Nothing more. Nothing less. With golf players in mind, this is a brand that you can trust right off the tee, and you’ll be sure to find the right one for you whether you’re just starting out or if you’re a long-time player. The Laser Link rangefinders are all designed to be used in tournament play, so there’s never any worry about having to leave your unit behind on the big day. They’re also unique in the way that they’re pistol shaped. You read that right, pistol shaped. This factor alone could be the persuasive nudge to pull out the credit card and add to the cart right now. Can it get any better than that? Let’s find out!